How many linear silver holographic polishes is enough for one gal? Two? Seven? 13? Well as far as I'm concerned, if they are all different, then you can just keep going and going. 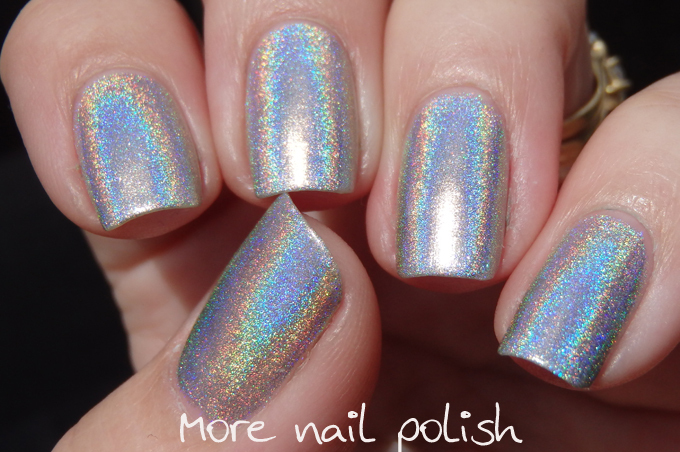 I'm at 18 linear silver holos now, and there are still some out there I would like to get my hands on. My latest addition is ILNP Mega (S). I was able to get in on a recent Aussie group buy during the pre-sale, and this is one of five ILNP shades I picked up. 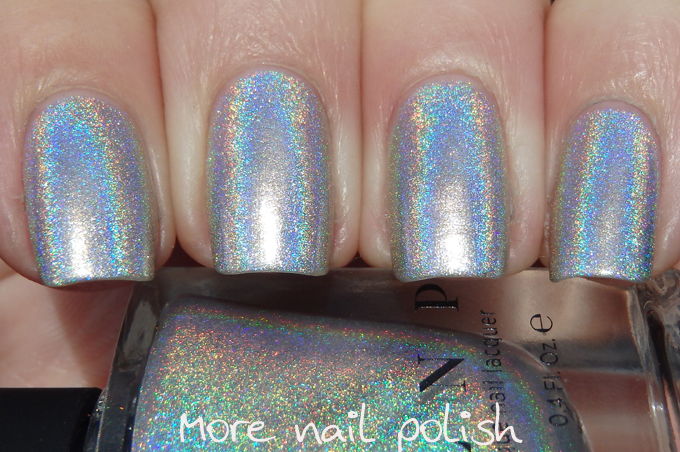 ILNP make the claim that Mega (S) is the brightest, most intense pure holographic nail polish out there. 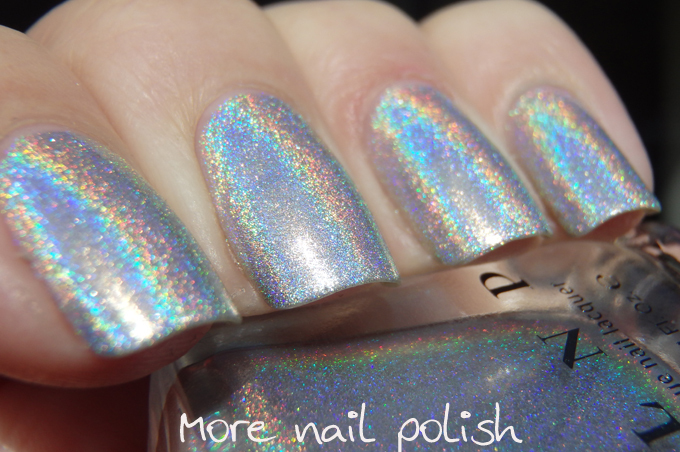 I have a comparison photo below of all my silver holos, and while I thought this looked totally stunning on my nails at the time, when you compare it to other silver holos, there is no way this is the most intense pure holo out there. First up, this is three coats of INLP Mega (S) on it's own. I was swatches some other shades the other night and decided to try a singer layer of Mega (S) layered over a dark colour. WOW! This is gorgeous! This is a dark brown polish, and I love that you can still see the warm shade beneath. You can actually tell it's a brown and not a black polish. Lots of rainbow flame. Me likey! Now here is my holo comparison. With 18 silver linear holo shades it's just too many to do them in a finger swatch. I think you will find this comparison interesting. A friend of mine recently acquired a bottle of Chanel Holographic, so I'm hoping I might be able to sneak a swatch stick out of her bottle to be able to include in my silver holo comparisons going forward. Above said friend clearly has an issue with silver holos like I do, as she is the one I first saw with her amazing silver holo Guess handbag. After seeing hers, I had to buy one immediately! You can't tell from this photo how totally amazing this silver holo bag is, but it is incredible! Love rocking my matchy matchy nails and bag. I LOVE this comparison! I've been so tempted to buy Mega (S) but after seeing all the other shades next to each other (and owning at least half of them myself lol) I think I might be covered for silver holos! XD Also, where did you get the purse?! It's to die for! The Babis from Guess Australia online. Shop.guess.net.au. And that bag is amazeballs!!!!!! 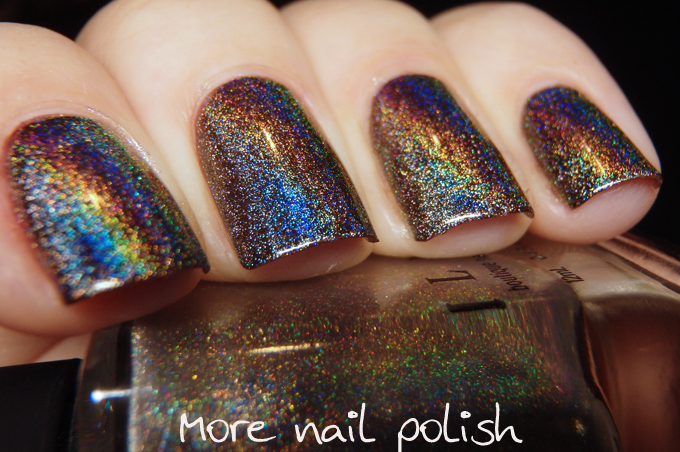 <3 I think I need one to match my holo shoes and wallet lol. 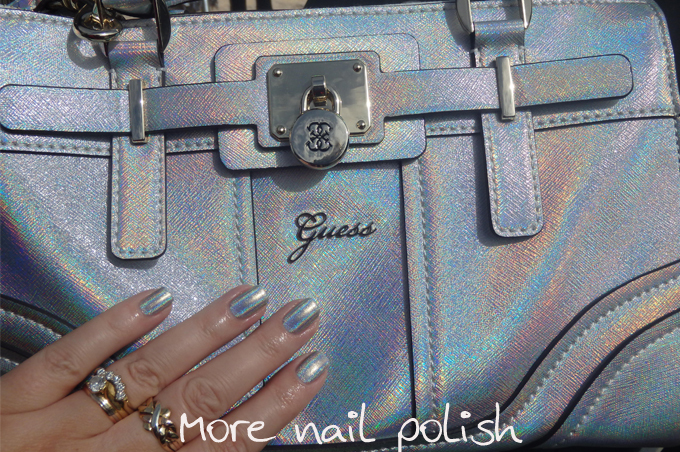 I'm goo goo ga ga over anything holo...right now I'm obsessed with that bag. Where did you get it and do they still have it for sale??? 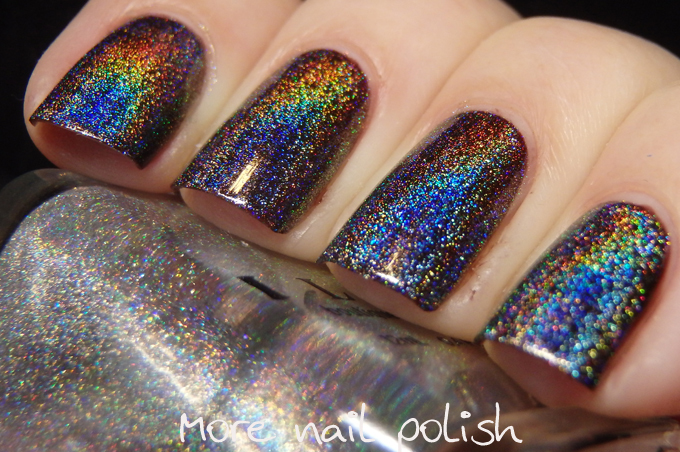 Oh, if ILNP's mega s isn't the most holo- EST out there what do you think is out of the ones you own? For me, the most intense holo I own is the original Nfu Oh 61. Yes, OMG is one special polish, there has been. Nothing like it since! I'm lucky I was into polish when those sets were still easily available. Ahhh!! I NEED that handbag! I wonder if I can find it in the US. Thanks Kittie26 for replying. I live in the US, and don't even know where to get the Nfu brand. In the US you can buy Nfu Oh from http://www.fabuloustreet.com/ , but the new formula of 61 isn't like the original. If you google for comparisons you will see that the new version is much much less holo and more metallic. I need that bag, too! I didn't find it on the guess.au site. I'm in US if anyone finds it. Woaw... I have about the same as you !!! Except for OMG, the 2 Dance legend, and Mirror ball. But I do have the 3 Mega, original, L and S, and the 2 versions of Gosh holo ! And the wonderful Dime piece from Enchanted Polish. 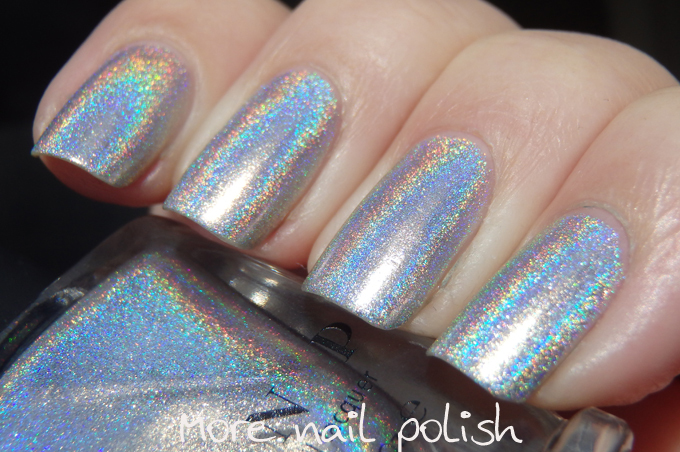 Try Perfect Holo H2, it gives Fnug a run for its money ! And I want that bag !!! Thanks for sharing the swatches. Just what I was hoping to see. Do you use a special base under GOSH Holo or Nfu Oh 61? If so what kind and is it still available? I have the GOSH holo but don't have the right base for it. I'm in the US and can't find MUS aqua fix or anything else anymore. 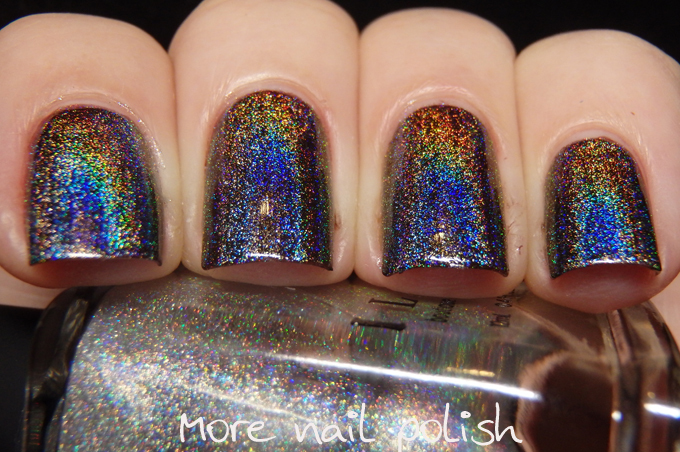 Also did you see that ILNP now has a Mega (X) that's suppose to be a stronger holo?